Located on an expansive 1,700-acre property in the heart of the White Mountains, Mountain View Grand Resort & Spa inspires grand occasions, intimate celebrations and memorable gatherings. New Hampshire's only hotel or resort to earn AAA Four Diamond honors for both Lodging and Dining since 2008, Mountain View has also been recognized as offering one of the top five resort spas in North America by the prestigious Conde Nast Traveler. We are also a proud member of Historic Hotels of America. The resort is noted for its beautiful surroundings, historic golf course, four Classic Clay tennis courts, cross-country skiing, ice skating, dog sledding, a health and wellness center, complimentary children's activities, and friendly service. Mountain View offers tasty dining at four distinctive venues, including an intimate slate-lined wine cellar. The formal Wine Cellar, cozy Harvest Tavern, and seasonal Club House are complemented by light fare on our magnificent Veranda. The resort has also opened its own Mountain View Farm, a vintage red barn and surrounding paddock with sheep, goats, chickens, angora rabbits, alpaca, and llamas, all friendly and fun for kids of all ages. 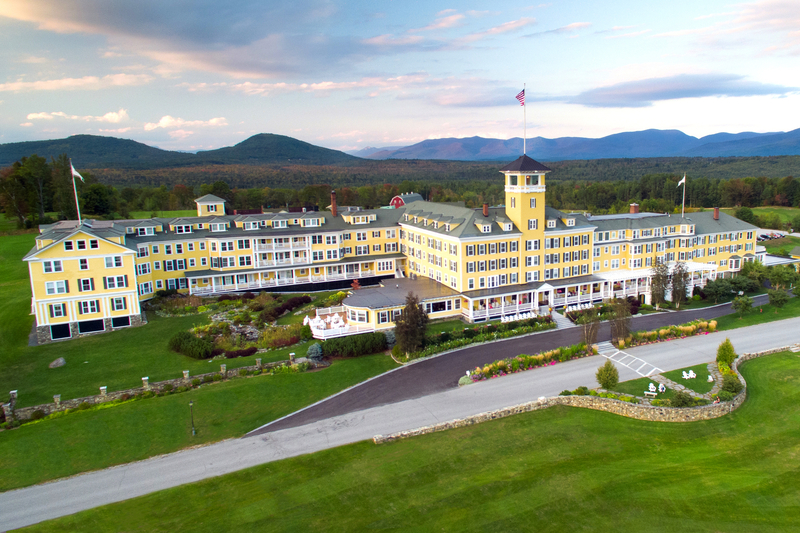 This celebrated landmark hotel evokes the classic New Hampshire charm and ambiance of the turn of the century. Today, as it has for well over 100 years, the expansive front veranda affords guests stunning, panoramic views while they enjoy the crisp mountain air. At this classic New Hampshire resort hotel, the grand tradition of resting, relaxing and rejuvenating continues year-round. We look forward to greeting you at the door like an old friend. Please join us for a New Hampshire White Mountains experience that promises and delivers a lifetime of memories.